WNV infections in the U.S. have caused at least 183 deaths thus far in 2012. At least five thousand one hundred and twenty-two [number of cases to be confirmed] West Nile virus infections have been reported to CDC ArboNET from 48 states as of posting. The cases are from Alabama, Arizona, Arkansas, California, Colorado, Connecticut, Delaware, District of Columbia, Florida, Georgia, Idaho, Illinois, Indiana, Iowa, Kansas, Kentucky, Louisiana, Maryland, Massachusetts, Michigan, Minnesota, Mississippi, Missouri, Montana, Nebraska, Nevada, New Hampshire, New Jersey, New Mexico, New York, North Carolina, North Dakota, Ohio, Oklahoma, Oregon, Pennsylvania, Rhode Island, South Carolina, South Dakota, Tennessee, Texas, Utah, Vermont, Virginia, Washington, West Virginia, Wisconsin, and Wyoming. About 70 percent of the cases have been reported from 8 states (Texas, California, Louisiana, Mississippi, Illinois, South Dakota, Michigan, and Oklahoma). More than a third of all cases have been reported from Texas. More than 51% of the cases are classified as neuroinvasive disease (such as meningitis or encephalitis). NOTE: 282 cases of fungal meningitis, stroke due to presumed fungal meningitis, or other central nervous system-related infection meeting the outbreak case definition, plus 3 peripheral joint infections (e.g., knee, hip, shoulder, elbow). No deaths have been associated with peripheral joint infections, CDC reported. Large scale groundwater extraction caused a 2011 earthquake in Spain which left at least nine people dead, more than 100 injured and thousands homeless, researchers said. A 5.1 magnitude earthquake near the city of Lorca in southeastern Spain occurred at a shallow depth 3 km, causing extensive damage. Researchers found the water table in the Alto Guadalentin Basin had dropped by 250 meters since 1960 due to groundwater extraction. “Modeling results are consistent with a groundwater crustal unloading process, providing a reasonable explanation for the observed fault slip pattern.” They said. WARNING: RAPID DECLINE IN PROGRESS! 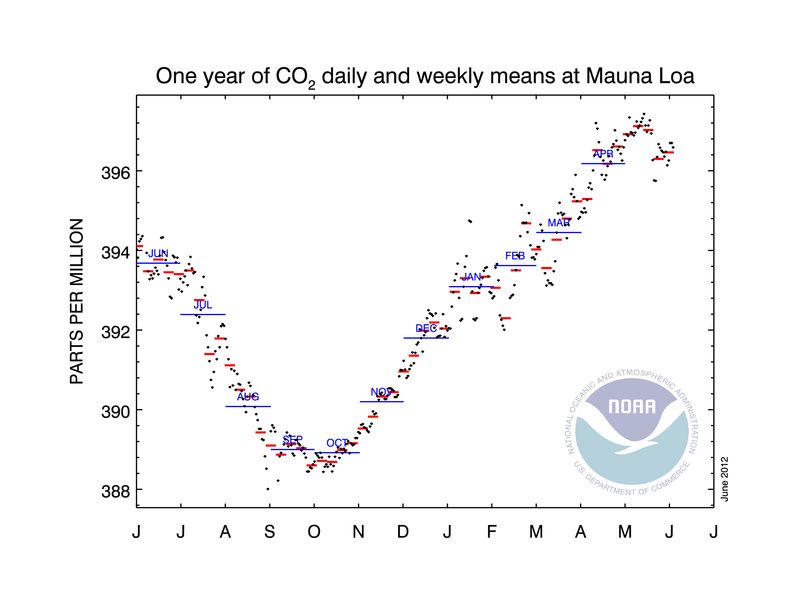 The graph, updated weekly, shows as individual points daily mean CO2 up to and including the week (Sunday through Saturday) previous to today. 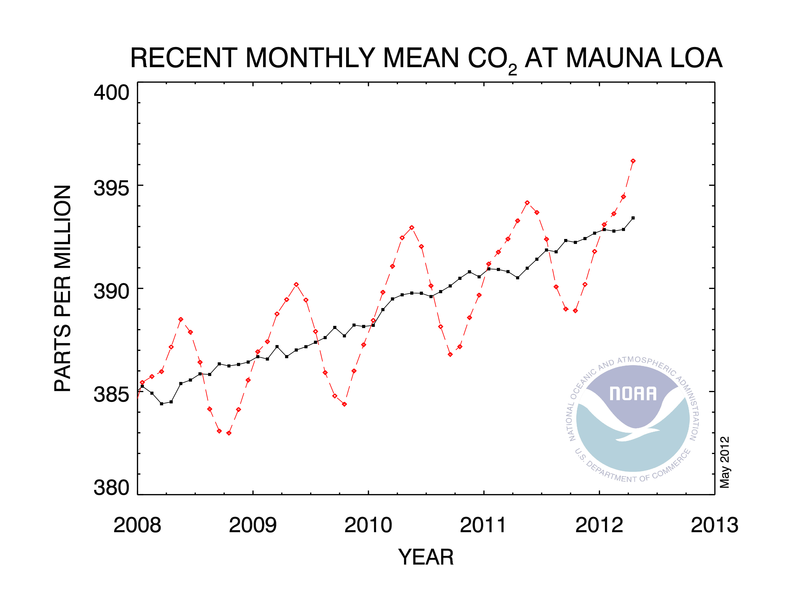 The graph shows recent monthly mean carbon dioxide globally averaged over marine surface sites, as measured by the Global Monitoring Division of NOAA/ESRL. The dashed red line with diamond symbols represents the monthly mean values, centered on the middle of each month. The black line with the square symbols represents the same, after correction for the average seasonal cycle. Virginia, USA. City of Hampton declared a state of emergency after a tornado struck Petersburg and Hampton, destroying or damaging dozens of building and causing injuries to residents. The tornado left several families displaced and caused millions of dollars in damage. U.K. Britain has undergone a moral decline over the past six decades, the Bishop of London has decried. Ironically, the period coincides with Queen Elizabeth’s 60 year reign on the throne. Promiscuity has reached “epidemic” levels. “Literally millions of children grow up without knowing a stable, loving, secure family life …,” he said. “Dr Chartres also called for action to tackle ‘depressingly high’ youth unemployment in Britain,” said a report. “The extent of youth unemployment is appalling. The waste of human talent is unsustainable morally and economically,” he said. Rising floodwaters which have killed or injured hundreds of people and destroyed thousands of homes across Thailand are now threatening the capital Bangkok. In view of the continued hacking and censorship of this blog by the Internet Mafia, the Moderators have decided to maintain only a minimum presence at this site, until further notice. FIRE-EARTH will continue to update the 2011 Disaster Calendar for the benefit of its readers. The Blog Moderators Condemn in the Strongest Possible Terms the Continued Removal of Content and Hacking of FIRE-EARTH and Affiliated Blogs by WordPress! Bangkok, Thailand. Rising floodwaters have killed or injured hundreds of people, destroyed thousands of homes across Thailand and are now threatening the capital Bangkok, the Prime Minister has warned. Floodwater has also destroyed millions of acres of crops, toppled bridges, severed rail links, shut dozens of highways and inundated the city of Ayutthaya. The floods which have triggered massive mudslides have killed at least 253 people, injured scores more and affected more than 8 million people in 60 of the country’s 77 provinces since late July, Thailand’s Department of Disaster Prevention and Mitigation said. Philippines. Combined toll from two deadly typhoons, NESAT and NALGAE, which struck the Philippines last week have climbed to at least 95, the National Disaster Risk Reduction and Management Council (NDRRMC). Some than 85 are injured and 34 missing, the agency reported. The heaviest flooding occurred in the three rice-producing provinces of Bulacan, Pampanga and Tarlac, affecting more than 3 million people. About 110,000 people have been displaced. The government had earlier declared several provinces as disaster areas. Central African Republic. A cholera outbreak in the Central African Republic has claimed 16 lives, with 57 other cases reported, AFP said. Too Bad Climate Juggernaut Delivering Deadlier Loads Next Year! Based on various climatic indicators and recent weather trends, FIRE-EARTH forecasts an increase of about 24% in the severity of extreme weather events during the next 20 months, compared with the previous period. Click images to enlarge and animate. Click image to enter NWS portal. NOW IS THE PERFECT TIME TO POWER DOWN AND START THINKING HARD. Encourage your folks, friends and neighbors to join in!! BECAUSE for most of us the GAME would be OVER soon. Flooding and fires, earthquakes and eruptions, deadly tornadoes and strong storms … are just some of the items you’ve ordered from the climate change quick menu! US Weather Warnings. Click image to enter NWS portal. Kansas City, Mo., Monday, Feb. 28, 2011 – NOAA forecasters said a strong spring-like storm system will move from the Lower Mississippi River Valley into the Ohio River Valley today, bringing widespread precipitation to the eastern third of the country. The system will draw warm, moist, unstable air from the Gulf of Mexico, setting the stage for strong to severe thunderstorms over a large area of the southern Plains and Southeast. Up to 1-2 inches of rain can be expected over a sizeable area of the Midwest that had to contend with heavy rain and severe weather through the weekend. Ever-shrinking snow and ice cover in the Northern Hemisphere, which contribute to “cyrospheric cooling,” now reflect only about 3.3Wm-² Solar Energy back to space, an average of 0.45Wm-² less than they did in the late 1970s, a new study says. Cyrospheric cooling has declined by an average of 0.45 W m-² from 1979 to 2008, according to the study, which was published in the Nature Geoscience journal Sunday. 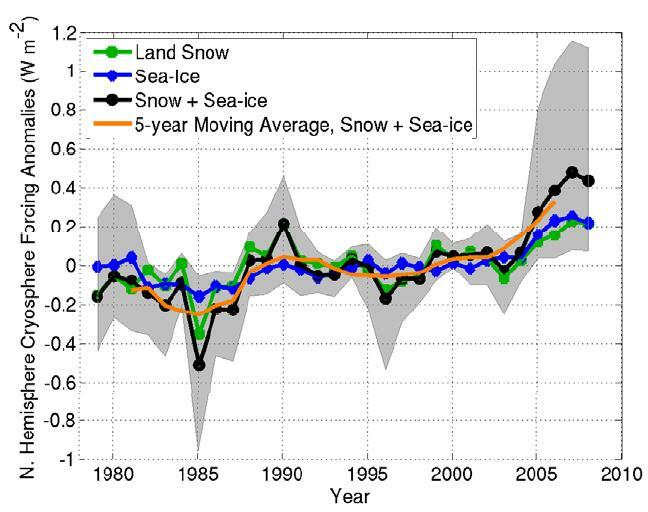 The extent of snow cover and sea ice in the Northern Hemisphere has declined since 1979, coincident with hemispheric warming and indicative of a positive feedback of surface reflectivity on climate. This albedo feedback of snow on land has been quantified from observations at seasonal timescales and century-scale feedback has been assessed using climate models. However, the total impact of the cryosphere on radiative forcing and albedo feedback has yet to be determined from measurements. Here we assess the influence of the Northern Hemisphere cryosphere on Earth’s radiation budget at the top of the atmosphere—termed cryosphere radiative forcing—by synthesizing a variety of remote sensing and field measurements. We estimate mean Northern Hemisphere forcing at −4.6 to −2.2 Wm-², with a peak in May of −9.0±2.7 Wm-². The planet’s shrinking snow and sea ice cover means less heat reflected back to space resulting in a positive feedback loop heating the globe. The warming is intensifying at a higher rate than climate models have predicted, according to new research. Image Credit: Mark Flanner. For each degree Kelvin (1.8 degree Fahrenheit) increase in temperatures, which reduces the Northern Hemisphere’s snow and ice cover, the solar energy reflected back to space decreases by between 0.3 and 1.1Wm-²K-². The study conclude that the albedo feedback from the Northern Hemisphere cryosphere decline is “substantially larger” when compared to estimates obtained from 18 other climate models. That is an average shortfall of 0.6Wm-² in Flanner’s research compared to IPCC allowance of 0.25Wm-² over the same period. The reduction in cyrospheric cooling effect, caused by snow and ice cover losses, increases the amount of solar energy that our planet absorbs, Mark Flanner, an assistant professor at the University of Michigan and lead author of the study, told Reuters. 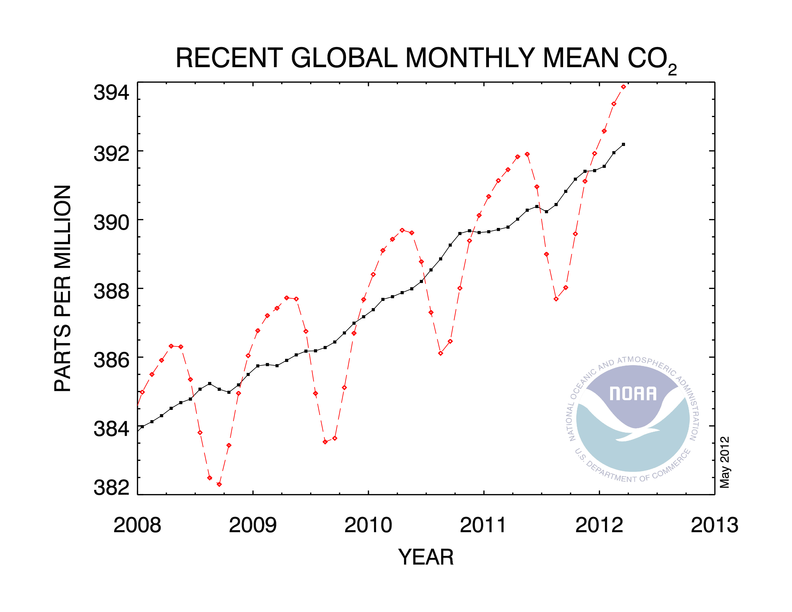 How does the new estimate compare with previous climate models? “This reduction in reflected solar energy through warming is greater than simulated by the current crop of climate models,” Flanner said. “If the Earth were just a static rock, we could calculate precisely what the level of warming would be, given a perturbation to the system. But because of these feedback mechanisms we don’t know exactly how the climate will respond to increases in atmospheric carbon dioxide,” he said. “On a global scale, the planet absorbs solar energy at a rate of about 240 watts per square meter averaged over a year. The planet would be darker and absorb an additional 3.3 watts without the Northern Hemisphere cryosphere,” Flanner said. The 1901-2000 average combined land and ocean annual temperature is 13.9°C (56.9°F), the annually averaged land temperature for the same period is 8.5°C (47.3°F), and the long-term annually averaged sea surface temperature is 16.1°C (60.9°F). Source: NOAA. WILL THIS MAKE A RAPIDLY COLLAPSING WORLD CHANGE ITS COURSE? Data acquired by NASA’s Goddard Institute for Space Studies (GISS), NOAA’s National Climatic Data Center (NCDC), the Japanese Meteorological Agency, and their British equivalent confirm an identical warming trend despite minor discrepancies. Both NASA and NOAA have declared 2010 tied with 2005 as the warmest year in their 131-year instrumental record. TRY ALL OF THE ABOVE! 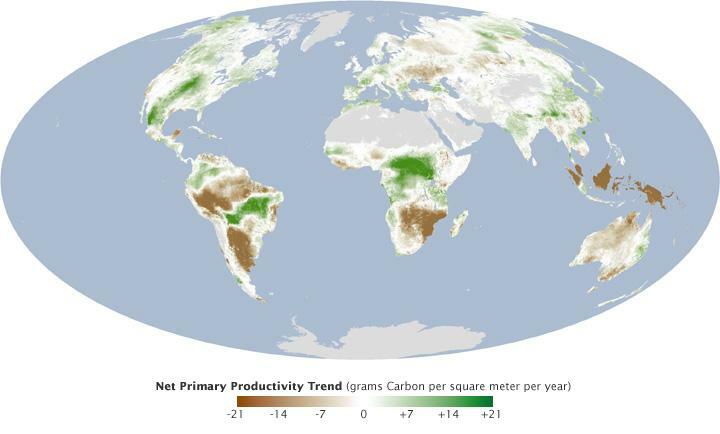 Contrary to conventional wisdom, researchers at the University of Montana have discovered that plant growth slowed for the 2000–2009, despite the decade being the warmest on record. “We see this as a bit of a surprise, and potentially significant on a policy level because previous interpretations suggested that global warming might actually help plant growth around the world,” one of the researchers said. “This is a pretty serious warning that warmer temperatures are not going to endlessly improve plant growth.” More information available in a feature article and on videos. Source: NASA E/O. Study this image carefully, and you could/should see yourself and your family in there! Fighting [sic] Climate Change anyone Right now, the floods are taking their toll in Pakistan. Next, they could hit YOUR hometown. Original Caption: Pakistani residents stand by flood water that entered a residential area of Muzaffarabad. The death toll from flash floods and landslides triggered by torrential monsoon rains in Pakistan rose to more than 400 as officials reported thousands more displaced. (Xinhua/AFP Photo). Image may be subject to copyright. See Fair Use Notice. Click image to enlarge and update. Click image to enter portal. Central Park hit a scorching 103 degrees, breaking a record set in 1999. Newark reached 103, a new all-time high. Record highs were also set at Newark (103 degrees), LaGuardia (103 degress) and JFK (101 degrees) airports. Dangerous heat tightened its grip on Salem County today as the mercury soared to the century mark here. The 103-degree recorded at McCormick Observatory is “a harbinger of weather to come,” officials said. That’s bad news for farmers across the state who have been hard hit by the heat, Virginia Farm Bureau officials said. James Hurrell of the U.S. National Center for Atmospheric Research said. “When someone says that society should wait until scientists are absolutely certain before taking any action, it is the same as saying society should never take action,” the 255 scientists wrote in an open letter published by the journal Science. Scientists conveyed the same message on Thursday before the U.S. House of Representatives panel on energy independence and climate change, a report said. Serial No 1,685. Starting April 2010, each entry on this blog has a unique serial number. If any of the numbers are missing, it may mean that the corresponding entry has been blocked by Google/the authorities in your country. Please drop us a line if you detect any anomaly/missing number(s). The Vanishing Parking Lot: Now You Don’t See it! Part of the parking lot at Scott Towne Center has given way, causing a landslide that is covering one lane of Greentree Road below in Scott. James Knox/Pittsburgh Tribune-Review. Image may be subject to copyright. Serial No 1,684. Starting April 2010, each entry on this blog has a unique serial number. If any of the numbers are missing, it may mean that the corresponding entry has been blocked by Google/the authorities in your country. Please drop us a line if you detect any anomaly/missing number(s). The official Xinhua agency, quoting the municipal government, reported the number of casualties as “at least 23 confirmed dead and 161 others injured” following a powerful storm and torrential rain that inundated China’s Chongqing Municipality earlier today. “Liangping county was also hit by a tornado and hailstorm, leaving six people dead and another 34 injured. Seventeen people died and 127 people were injured in Dianjiang county, according to rough statistics.” Xinhua said. 2010 could prove one of China’s worst years for natural phenomena transformed to human-enhanced disasters. 2011 could be even deadlier. Serial No 1,679. Starting April 2010, each entry on this blog has a unique serial number. If any of the numbers are missing, it may mean that the corresponding entry has been blocked by Google/the authorities in your country. Please drop us a line if you detect any anomaly/missing number(s). 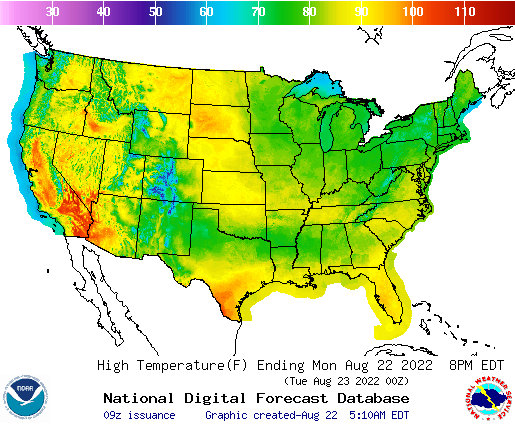 National Weather Service (NWS) Weather Hazard Map. Click image to update and select areas of interest. Serial No 1,675. Starting April 2010, each entry on this blog has a unique serial number. If any of the numbers are missing, it may mean that the corresponding entry has been blocked by Google/the authorities in your country. Please drop us a line if you detect any anomaly/missing number(s). Houses, schools, bridges and other structure were washed off. The cost of damage in the three battered states could exceed 200million dollars. At least 9 of the deaths occurred in Nashville, where thousands of homes and tourist attractions, including Grand Ole Opry, were inundated. The Cumberland River that runs through the city crested at a 75-year high, more than 4m (12 feet) above flood stage, afetr 457mm (18 inches) of weekend rain. At least four people lost their lives in Kentucky where Governor Steve Beshear declared a state of emergency with 41 counties and 15 cities issuing emergency declarations most of them verbally. At least 6 people were reported as being killed in various storm and flood-related incident in Mississippi, where a tornado from a separate storm front a week earlier had claimed 10 lives. Airplanes are seen partially submerged in floodwater at the Cornelia Fort Airpark Tuesday, May 4, 2010, in Nashville, Tenn. Heavy weekend rain caused the Cumberland River, which winds through Nashville, to over flow its banks flooding part of downtown and other areas around the city. (AP Photo/Jeff Roberson). Image may be subject to copyrights. S.F. Fork Forked Deer River…S.F. Strong southwest winds and dry conditions are expected again on Wednesday over southwest Colorado. Gusty southwest winds will redevelop over western Colorado on Wednesday as a tight pressure gradient will remain over Colorado. The strong winds in combination with low relative humidity and dry fuels at the lower elevations of southwest Colorado will produce critical fire conditions. 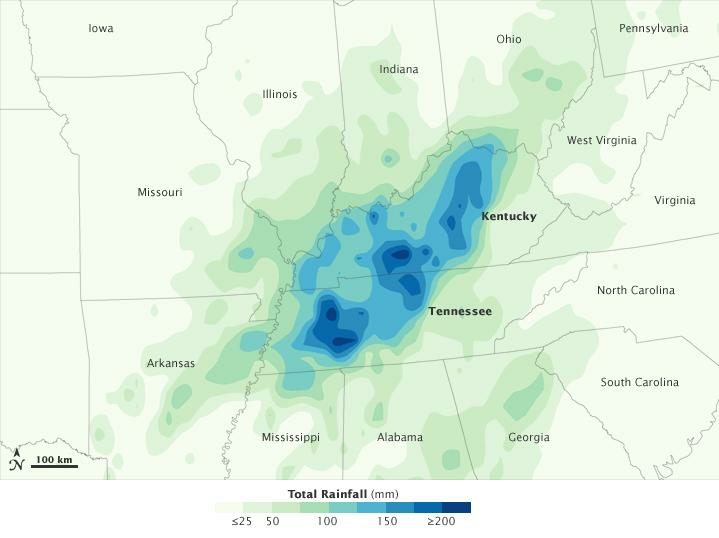 Extreme rain inundated Tennessee and Kentucky on May 1-2, 2010. A line of severe thunderstorms moved over the states on Saturday, May 1, and a high-pressure system blocked the storms from moving east. Trapped in place and fed by humid air from the Gulf of Mexico, the storms unleashed heavy rain on the Tennessee Valley. By 7:00 p.m. on May 2, rain gauges on the ground recorded between 10 and 19 inches (250-480 millimeters) of rain in the hardest hit regions. This image shows rainfall totals between May 1 and May 3, 2010, as recorded by the TRMM satellite. The intense rain shown here caused severe flooding throughout Tennessee, particularly in Nashville. Image and Caption: NASA [Edited by FEWW for brevity.] Click image to enlarge. Serial No 1,674. Starting April 2010, each entry on this blog has a unique serial number. If any of the numbers are missing, it may mean that the corresponding entry has been blocked by Google/the authorities in your country. Please drop us a line if you detect any anomaly/missing number(s). 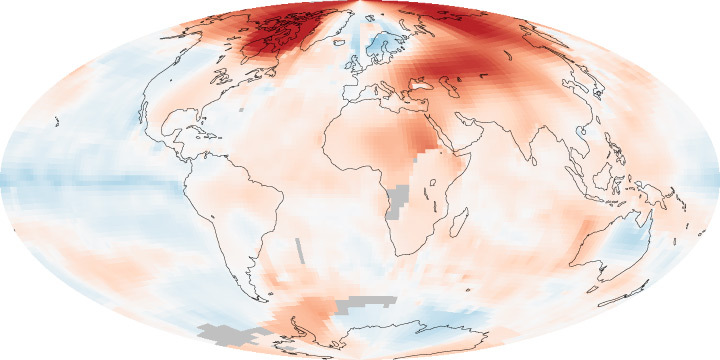 The surface temperature of the world’s oceans increased over the 20th century. Even with some year-to-year variation, the overall increase is statistically significant, and sea surface temperatures have been higher during the past three decades than at any other time since large-scale measurement began in the late 1800s. Average sea level worldwide has increased at a rate of roughly six-tenths of an inch per decade since 1870. The rate of increase has accelerated to more than an inch per decade in recent years. Changes in sea level relative to the height of the land vary widely because the land itself moves. Along the U.S. coastline, sea level has risen the most relative to the land along the Mid-Atlantic coast and parts of the Gulf Coast, while sea level has decreased relative to the land in parts of Alaska and the Northwest. The ocean has become more acidic over the past 20 years, and studies suggest that the ocean is substantially more acidic now than it was a few centuries ago. Rising acidity is associated with increased levels of carbon dioxide dissolved in the water, can affect sensitive organisms such as corals. 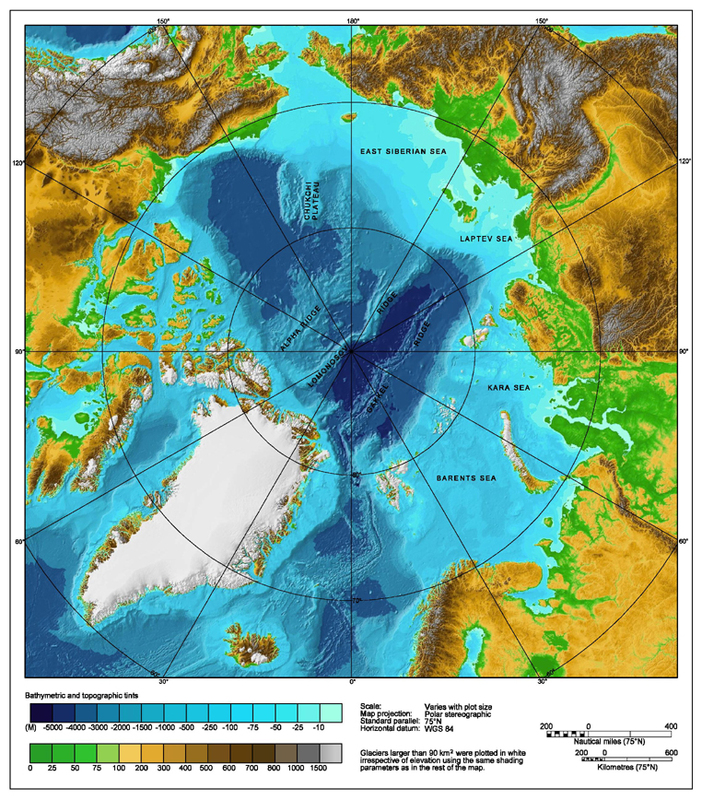 Part of the Arctic Ocean stays frozen year-round. The area covered by ice is typically smallest in September, after the summer melting season. September 2007 had the least ice of any year on record, followed by 2008 and 2009. The extent of Arctic sea ice in 2009 was 24 percent below the 1979 to 2000 historical average. Glaciers in the United States and around the world have generally shrunk since the 1960s, and the rate at which glaciers are melting appears to have accelerated over the last decade. Overall, glaciers worldwide have lost more than 2,000 cubic miles of water since 1960, which has contributed to the observed rise in sea level. Lakes in the northern United States generally appear to be freezing later and thawing earlier than they did in the 1800s and early 1900s. The length of time that lakes stay frozen has decreased at an average rate of one to two days per decade. The portion of North America covered by snow has generally decreased since 1972, although there has been much year-to-year variability. Between 1950 and 2000, the depth of snow on the ground in early spring decreased at most measurement sites in the western United States and Canada. Spring snowpack declined by more than 75 percent in some areas, but increased in a few others. Over the past three decades, more than 6,000 deaths across the United States were caused by heat-related illness such as heat stroke. However, considerable year-to-year variability makes it difficult to determine long-term trends. The average length of the growing season in the lower 48 states has increased by about two weeks since the beginning of the 20th century. A particularly large and steady increase has occurred over the last 30 years. The observed changes reflect earlier spring warming as well as later arrival of fall frosts. Winter low temperatures are a major factor in determining which plants can survive in a particular area. Plant hardiness zones have shifted noticeably northward since 1990, reflecting higher winter temperatures in most parts of the country. Leaf growth and flower blooms are examples of natural events whose timing can be influenced by climate change. Observations of lilacs and honeysuckles in the lower 48 states suggest that leaf growth is now occurring a few days earlier than it did in the early 1900s. Lilacs and honeysuckles are also blooming slightly earlier than in the past, but it is difficult to determine whether this change is statistically meaningful. Some birds shift their range or alter their migration habits to adapt to changes in temperature or other environmental conditions. Long-term studies have found that bird species in North America have shifted their wintering grounds northward by an average of 35 miles since 1966, with a few species shifting by several hundred miles. What do these changes translate into in layman terms? Serial No 1,643. Starting April 2010, each entry on this blog has a unique serial number. If any of the numbers are missing, it may mean that the corresponding entry has been blocked by Google/the authorities in your country. Please drop us a line if you detect any anomaly/missing number(s). FEWW Moderators believe magnitude of the seismicity most likely intensified as a result of icemelt in the region. Other examples of climate-intensified natural events would be posted on this blog when they occur.